As in many cities around the country, Black Lives Matter held a demonstration in Dallas to protest the police shootings of two more black men, Alton Sterling of Louisiana and Philando Castile of Minnesota. During the demonstration, Micah Xavier Johnson, an Army veteran who served in Afghanistan, mounted his own personal, deadly protest by shooting police officers guarding the nonviolent rally. Five officers were killed and seven wounded. After negotiating for some time with Johnson, who was holed up in a community college parking garage, police sent in a robot armed with explosives and killed him. Dallas police chief David Brown said, "We saw no other option but to use our bomb robot and place a device on its extension for it to detonate where the subject was," adding, "Other options would have exposed our officers to grave danger." The legal question is whether the officers reasonably believed Johnson posed an imminent threat of death or great bodily injury to them at the time they deployed the robot to kill him. Johnson was apparently isolated in the garage, posing no immediate threat. If the officers could attach explosives to the robot, they could have affixed a tear gas canister to the robot instead, to force Johnson out of the garage. Indeed, police in Albuquerque used a robot in 2014 to "deploy chemical munitions," which compelled the surrender of an armed suspect barricaded in a motel room. But the Dallas police chose to execute Johnson with their killer robot. This was an unlawful use of force and a violation of due process. The right to due process is a bedrock guarantee, not just in the U.S. Constitution, but also in the International Covenant on Civil and Political Rights, a treaty we have ratified, making it part of our domestic law. Due process means arrest and fair trial. It is what separates democracies from dictatorships, in which the executive acts as judge, jury and executioner. During the standoff, Johnson reportedly told police there were "bombs all over" downtown Dallas. The police didn't know if that was true. In order to protect the public, they could have interrogated him about the location of the bombs after getting him out of the garage with tear gas. Apprehension and interrogation are recommended in a 2013 study conducted by the Pentagon's Intelligence, Surveillance, and Reconnaissance Task Force. The study was cited in "The Drone Papers," leaked to The Intercept by an anonymous whistleblower who was a member of the intelligence community. It concluded, "kill operations significantly reduce the intelligence available from detainees and captured material" and recommended capture and interrogation rather than killing in aerial drone strikes. The Obama administration currently uses unmanned armed drones to kill people in seven countries, effectively denying them due process. 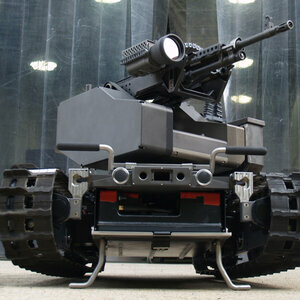 There is a slippery slope from police use of armed robots to domestic use of armed drones. The Dallas police department's robot was apparently manufactured by Northrup Grumman, the same company that makes the Global Hawk drones, used for surveillance in Obama's drone program. More than half the U.S.-Mexico border is patrolled with surveillance drones. Customs and Border Protection is considering arming them with "non-lethal" weapons. That could include rubber bullets, which can put out an eye. The killing of Johnson is evidently the first time domestic law enforcement has utilized an armed robot to kill a suspect. It will not be the last. Police departments are becoming increasingly militarized, using assault weapons, armored personnel carriers, grenade launchers, and ear-splitting sirens known as LRADs. Much of this equipment is purchased from the Pentagon at a significant discount.